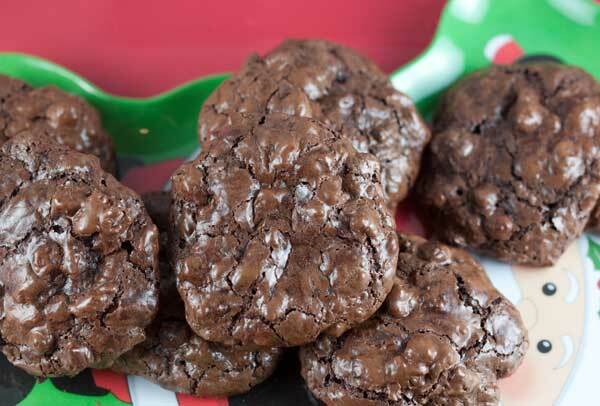 Flourless Double Chocolate Pecan Cookies are naturally gluten free and totally delicious! Preheat oven to 350 degrees. Spread the pecan halves on a baking sheet and toast for about 7 minutes or until pecans are aromatic. Alternatively, you can toast them in a large skillet. Let the pecans cool. Reduce oven heat to 325 degrees F. Line two baking sheets with parchment paper. In a large bowl, sift together powdered sugar, cocoa and salt. Stir in chopped chocolate and chopped pecans. Add egg whites and stir with a heavy duty scraper or large mixing spoon until mixture is shiny. Using a generously heaping tablespoon measure, drop mounds of batter about 3 inches apart onto baking sheets. Bake until cookie tops are dry and crackled, about 20 minutes, rotating baking sheets halfway through. Allow the cookies to cool on the baking sheets for about 5 to 8 minutes, then carefully peel away from parchment and let cool completely.